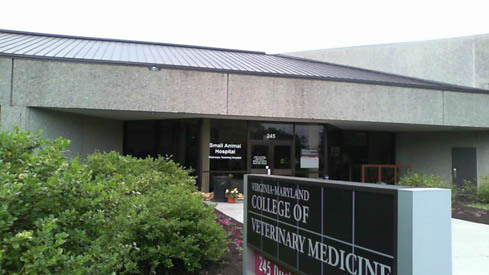 The Veterinary Medicine branch library is located in the Phase III Building of the Virginia-Maryland Regional College of Veterinary Medicine on Duck Pond Drive near the "cage" residential parking lot. Visitors will need to obtain a daily parking pass to avoid being ticketed. Visitor parking passes allow for vehicles to be parked in the lot next to the building or in the large residential parking lot next to the complex. To get to the Vet Med Library, visitors must stop at the Small Animal Hospital service desk and get a visitor's pass to enter the building. 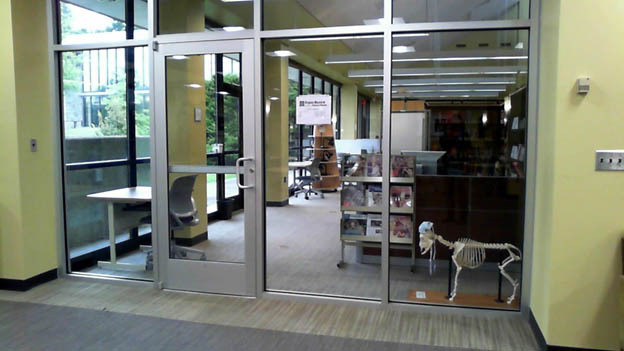 The Vet Med Library is open to the public. For visitors who do not have keycard access to the building, you must request a visitor pass at the Small Animal Hospital. A current photo ID is required to obtain a visitor's pass. Visitor passes are only available between the hours of 8am-5pm, Monday - Friday. Once a visitor pass (keycard) has been issued, go back into the foyer and swipe the keycard at the access point on the doors to the right. Follow the hallway; it will first bend to the right, then as you get to the area where it forks (mirror ball on the ceiling) follow the main hallway to the left. Shortly down the hall you will come to a room with the glass doors (this will be on your left). 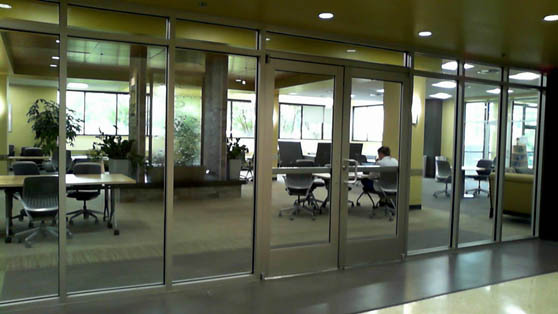 Enter that room (also known as the "waterfall room") and on the right hand side there is a glass door that is the entrance to the Veterinary Medicine Library. When you leave the library, return to the Small Animal Hospital to return the visitor pass and pick up your photo ID.